Note: If you are already enrolled in Visa Checkout with a United MileagePlus Visa card, you are not eligible for this offer. Limit of 1 bonus per cardmember. 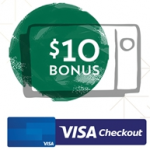 Allow 6 to 8 weeks from the date of your Visa Checkout transaction for delivery of the 500 mile bonus. Your card account must remain open and not be in default to receive the bonus miles award. Note 2: This offer is valid on all MileagePlus-earning Visa cards, so it applies to both business and personal cards. If you already have an existing Visa Checkout account linked to a different card, you should be able to close your old account and open a new one to take advantage of this deal.